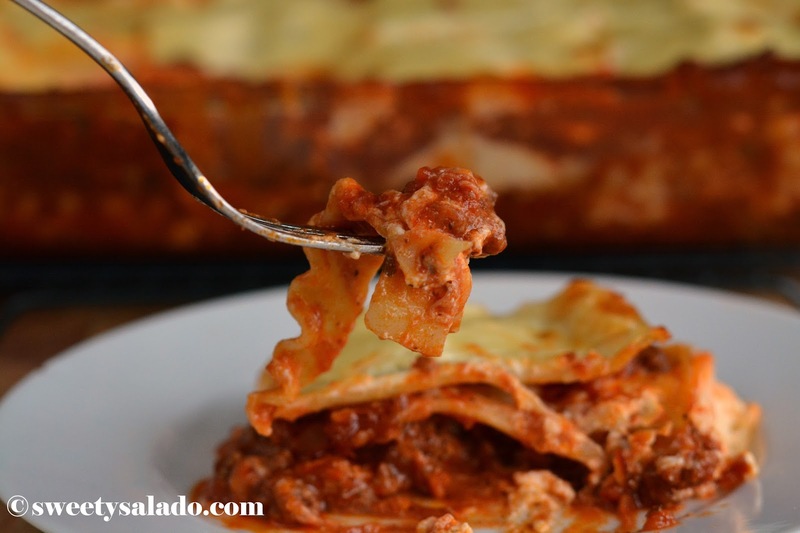 Here’s a wonderful, classic lasagna recipe that I know you will love. I know that the photo doesn’t do it justice because it was still warm when I took it, but I really wanted to show you that delicious melting cheese on top. The lasagna just didn’t cooperate with me very well. But believe me when I say that this lasagna recipe is so good, you will probably save it for life. The meat sauce is a combination of Italian sausage and ground beef with a splash of red wine to give it something extra. If you can’t find Italian sausage where you live, you can just double the amount of ground beef and increase the amount of seasonings. Also, if you can’t find Italian seasoning either, you can easily make it at home with any recipe you find on the Internet. If you do a Google search, you will find lots of options. And don’t worry if you don’t have a lasagna pan to make it. I don’t have one and don’t plan on buying one because I don’t have room for it in my small kitchen and besides, there’s only two of us at home, so making a ton of it does not really make much sense. Heat olive oil in a large pot over medium heat. Add the onion and cook for 5-10 minutes or until it's translucent. Add the garlic and cook for another minute. Now, add the Italian sausage and ground beef and cook until it's no longer pink. Break it apart with the help of a spatula until it cooks. Add the red wine and cook for about 5 minutes. Add the crushed tomatoes, tomato sauce and tomato paste. Stir well. Season with the dry basil, Italian seasoning, sugar and parsley. Stir again. Cover the pot and simmer (low - medium low heat) for 1½ - 2 hours. The longer, the better. Then, season with salt and pepper to taste. Set the sauce aside. (You can also make the sauce the day before and refrigerate it. This way you can also skim off any fat that ends up on the surface). Cook the lasagna noodles according to the instructions on the package. Drain and leave them soaking in cold water to avoid sticking. In a large bowl, mix well the ricotta cheese, eggs, Parmesan cheese, salt and grated nutmeg. Set aside. 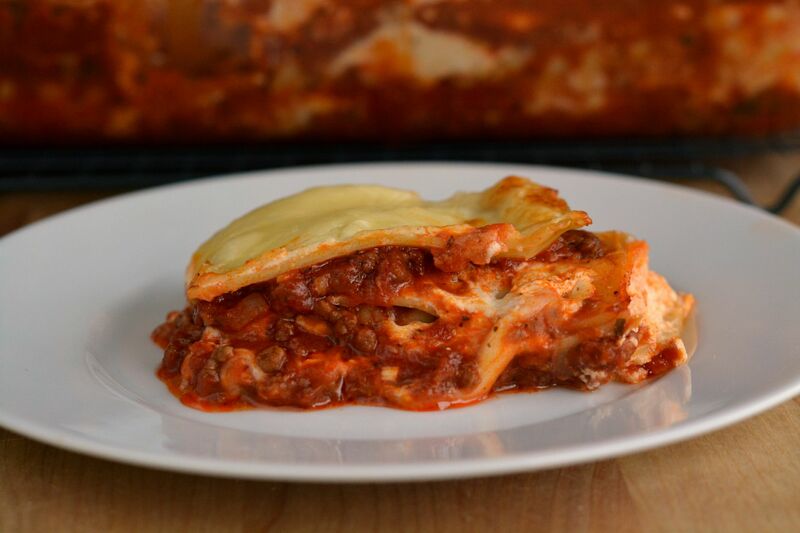 Spray a 9 x 13 inch (23 x 33 cm) baking pan with either cooking spray or olive oil so the lasagna doesn't stick to it. Spread one layer of meat sauce on the bottom of the pan. Top sauce with 4-6 lasagna noodles. Spread a layer of the ricotta cream on top of the noodles. Place a layer of mozzarella cheese (about 6 slices) over the ricotta. And finish with a layer of Parmesan cheese. Continue with this process two more times ending with a layer of Parmesan cheese. 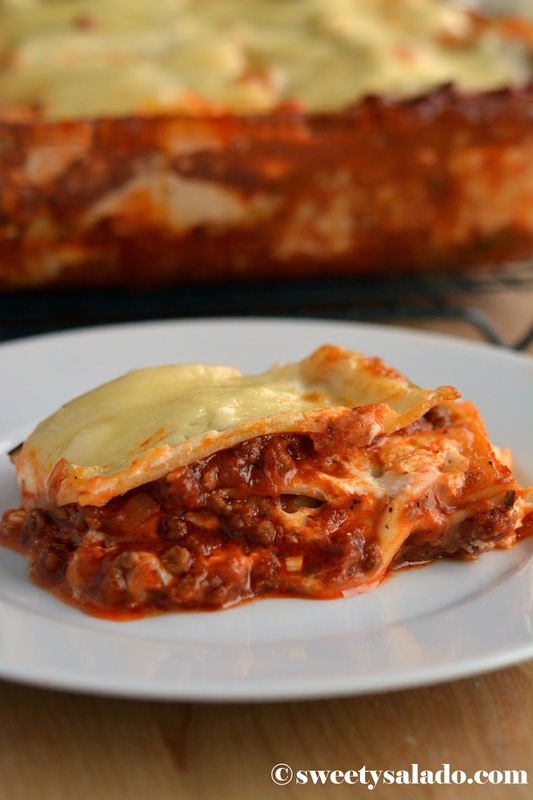 (Order of layers: meat sauce, lasagna noodles, ricotta cream, mozzarella cheese, Parmesan cheese). Cover the lasagna with nonstick aluminum foil or spray regular aluminum foil with cooking spray. Place it on a cooking sheet and bake it in a pre-heated oven at 375ºF (180ºC) for 25 minutes. Remove the aluminum foil and bake for another 15-20 minutes or until the cheese melts on top. Let it set for about 30 minutes before serving. Made this Sunday night for Monday nights dinner. I did not deviate from the recipe and it was delicious. Served this with a large salad and garlic bread. My husband loved it and so do I. Can't wait for the leftovers tonight.